I was so overwhelmed with looking for invitations online. Julie helped me narrow down the style I wanted based on my taste and we were able to choose something perfect much faster than I would have been able to do myself online. 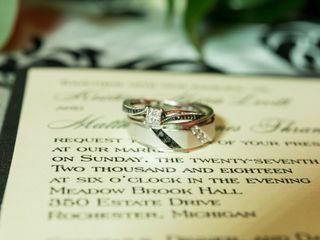 She also helped me with the wording on my invites, and thought of things I never would have. Really enjoyed! Everything came back super fast too! Exactly what I wanted. Definitely recommend. 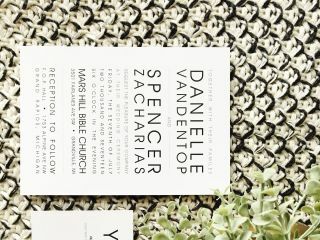 Working with the invitation place made my job so much simpler! Julie is professional and knows exactly how to word your invitation for how casual or formal your event is. She was able to custom order the exact pockets I wanted for our invitations and they were everything I dreamed of and more. 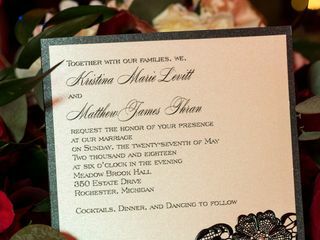 The invitations were of high quality, very affordable and came quickly. We also got our seating chart from the Invitation Place. I received so many compliments on both my invitations and seating chart. She responds quickly and answers all questions thoroughly. You wont be disappointed with anything Julie does for you! Will be using her for any future events I have! Julie was a joy to work with. She did all she could to help me get the look I wanted for the price I wanted. I appreciated her willingness to price out multiple options before we choose one. She did lots of mock ups so I could see what I wanted. I would highly reccomend that anyone work with Julie. Working with Julie was the best thing ever! 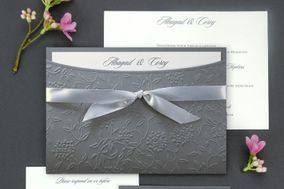 She was very helpful and was able to fill our invitation order quickly and they were beautiful! I highly recommend her service. The service my now wife and I received was wonderful. Very knowledgeable and flexible with us. I would personally recommend them to anyone looking for invitations. Julie was amazing! Had plenty of options to look through, and lots of examples to help you envision what your final product will look like, since invitations can be made so custom and personalized. Very friendly and easy to work with - would recommend her to all future brides! Julie was extremely helpful in assisting me pick out the perfect invitations for my wedding. I got so many compliments from my guest on how unique they were! She knew her products and was wonderful to work with. I will definitely recommend her to my friends! Julie was awesome to work with! She was very helpful in picking out invitations that match our style! Very good pricing! I am so thankful I found the Invitation Place! It saved me the headache of trying to create something myself online, and it was priced so well! I wasn't finding anything on my own in that price range that I liked! Julie was really great to work with and our invitations were exactly what I had pictures. She has so much to choose from and makes the process very comprehensive. The invitation place did an amazing job on my wedding invitations. They were beautiful! I had so many compliments on them and couldn't have been happier with how they turned out!! Julie has been in the business for more than 20 years. She had fantastic ideas for save the date cards and wedding invitations. 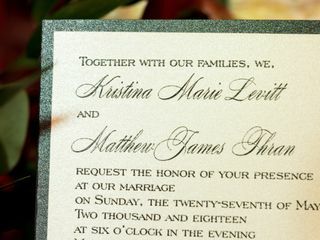 She communicated with us effectively and was timely with printing all of our invitations, place cards and table numbers. Julie is a true professional and we will highly refer her to others! The invitation place was excellent to work with. Therevwe many options to choose from and Julie made the process very easy. She provided wording advice to ensure the invitations liked amazing!